Gone of the days where I use to think having lots of emails made me ‘popular’... then came the days where lots of emails drained my time and energy… then came the days where I went on a research binge, netflix style, to find all the tools, tips and tricks that would help me better manage my inbox. 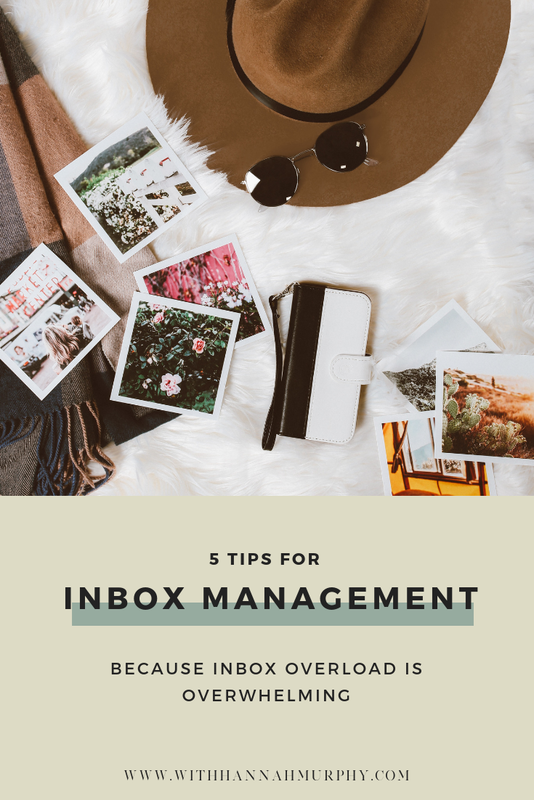 These 5 tips are still applied daily in my business and have found them a great starting point to better managing my inbox. There are a LOT of tools, tips and tricks online, so I could write many more blog posts on this, however these are practical tips to get you started, let’s dig in! With Unroll.me you are able to unsubscribe in bulk or choose to ‘roll’ it up- this means that each morning you receive an email from Unroll.me with the latest emails from that day and you can choose which ones you want to read or file that email to read later at the end of your week. One of the mistakes I use to make was keeping my email tab open constantly [no judgement if that’s currently you;)]. I found that by constantly checking and responding to emails, I found myself easily distracted and my to do list for the day was determined by my email list. Start of work- spend 15 mins responding to urgent emails and creating tasks that have come from it on my end of day wrap up. End of day: spend 30mins-1hr (depending on how many emails) to clean it out and finish off any tasks e.g. counter sign a contract for a client. The reason I leave the big batch till the end of the day is because I want to prioritise the tasks I have allocated for that day and not become distracted by what I read in my inbox. It enables to focus all my energy on the high profit generating tasks like client work and marketing, and finishing the day with interacting with potential clients etc - which is something I love and doesn’t require large amounts of brain space for me. I’m not saying follow my routine exactly, yet I would encourage you to find a daily routine for you… maybe you only check it once a day or maybe 2 times a day, or maybe you hire someone to manage your inbox and only check the folder allocated for you. Whatever it is, remember that your inbox isn’t there to dictate your day, it is there to assist you and your business so manage it the way that works best for you. Do you have emails that you find yourself repeatedly writing over and over again? E.g. a client inquiry response, a ‘too expensive’ template, a fully booked template, an onboarding welcome email… I have a way to reduce the amount of time these take - TEMPLATES… they will save your life. I always use to avoid templates because I didn’t want to remove the personality from it, and potentially turn people off, thinking that I didn’t care. However, what I have found is that by having templates in canned responses, I have more time to actually add in personalization as I’m able to spend more time in the response rather than thinking of all the basic important info I need to include. There are tools better than your inbox… I know that’s a big call… however the back and forth email can become quite difficult to manage clients. The purpose of my inbox is to rather nurture potential clients and enable people to contact me for purposes related to my business. For me clients are the most important part of my business, so in order for me to manage them best, I have found alternative tools so that I don’t loose an email or let it get lost in my inbox. Creating a gmail signature with your business hours will enable people to see your boundaries. No more replies at odd hours of the night, you can feel confident in the hours you have set for yourself… and if you happen to be needing to reply to emails outside of business hours you can use a plug-in called boomerang which enables you to schedule emails in advance to send out at an allocated time. I hope this has helped given you some ideas for ways to manage your inbox. Comment below what your favourite tip is and share one of yours that helps you stay on top of your inbox, i’d love to hear it! *This website contains affiliate links, which means that if you click on one of the product links, I’ll receive a small commission. The helps support my free resources and I am so grateful for your support. I wouldn’t send you to a place I didn’t believe in or have experience with.